For Ottoman general of World War I, see Abdul Kerim Pasha. For other people named Abdi Pasha, see Abdi Pasha. This is an Ottoman Turkish style name. Abdülkerim Nadir is the given name, the title is Pasha, and there is no family name. 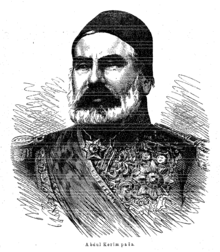 Abdülkerim Nadir Pasha (1807–1883), also known as Çırpanlı Abdi Pasha or Abdul Kerim Pasha, son of Ahmed Ağa, was an Ottoman military commander, born in Chirpan, Ottoman Bulgaria. He graduated from the military academy in Istanbul and was sent to Vienna to continue his education (1836–1841). He was the commander of the Ottoman forces based in eastern Anatolia during the Crimean War where he led many assaults against the Russian forces based in Gyumri. He assumed the command of the fortress at Kars and won the Battle of Bayandir. 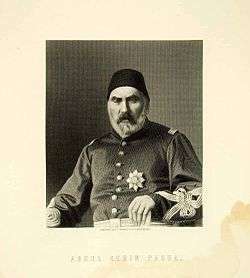 But after a military failure by Ahmet Pasha, he was blamed and subsequently discharged from his position and replaced by Ahmet Pasha in January 1854. After the war he was appointed as the governor of Thessaloniki. He was elected to the constitutional parliament in 1876 as a senator, though he retained his position in the army and dealt with several riots in Serbia in 1877. Because of his success in dealing with these riots, he was appointed as the commander of a division of the Danube forces during the Russo-Turkish War. After several command failures in this war, he was court martialed and exiled to the island of Rhodes, where he died. ↑ Candan Badem, The Ottoman Crimean War (1853-1856), BRILL, 2010, p. 143., The Ottoman Anatolian army was in a much neglected state in comparison with the Rumelian army. The Anatolian army was under the command of Müşir Abdülkerim Nadir Pasha (better known as Çırpanlı Abdi Pasha, 1807-1883) and this army was deployed in Erzurum, Kars, Ardahan and Bayezid. Wikimedia Commons has media related to Abdi Pasha.